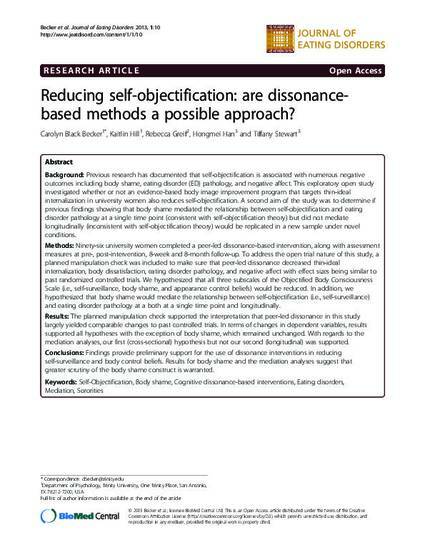 Reducing self-objectification: Are dissonance-based methods a possible approach? Background Previous research has documented that self-objectification is associated with numerous negative outcomes including body shame, eating disorder (ED) pathology, and negative affect. This exploratory open study investigated whether or not an evidence-based body image improvement program that targets thin-ideal internalization in university women also reduces self-objectification. A second aim of the study was to determine if previous findings showing that body shame mediated the relationship between self-objectification and eating disorder pathology at a single time point (consistent with self-objectification theory) but did not mediate longitudinally (inconsistent with self-objectification theory) would be replicated in a new sample under novel conditions. Methods Ninety-six university women completed a peer-led dissonance-based intervention, along with assessment measures at pre-, post-intervention, 8-week and 8-month follow-up. To address the open trial nature of this study, a planned manipulation check was included to make sure that peer-led dissonance decreased thin-ideal internalization, body dissatisfaction, eating disorder pathology, and negative affect with effect sizes being similar to past randomized controlled trials. We hypothesized that all three subscales of the Objectified Body Consciousness Scale (i.e., self-surveillance, body shame, and appearance control beliefs) would be reduced. In addition, we hypothesized that body shame would mediate the relationship between self-objectification (i.e., self-surveillance) and eating disorder pathology at a both at a single time point and longitudinally. Results The planned manipulation check supported the interpretation that peer-led dissonance in this study largely yielded comparable changes to past controlled trials. In terms of changes in dependent variables, results supported all hypotheses with the exception of body shame, which remained unchanged. With regards to the mediation analyses, our first (cross-sectional) hypothesis but not our second (longitudinal) was supported. Conclusions Findings provide preliminary support for the use of dissonance interventions in reducing self-surveillance and body control beliefs. Results for body shame and the mediation analyses suggest that greater scrutiny of the body shame construct is warranted. Becker, C. B., Hill, K., Greif, R., Han, H., & Stewart, T. (2013). Reducing self-objectification: Are dissonance-based methods a possible approach? The Journal of Eating Disorders, 1(10), doi:10.1186/2050-2974-1-10.